I like to plan. I like to plan what I'll say in certain situations, what I'll do. I think of possible outcomes and plan how I'll respond, I deliberate on the alternatives and plan how I'll react. As a child, I remember meticulously planning my emergency exit strategy in the event of a fire; questioning my mum as to whether the chair would successfully break my bedroom window and how I'd manage to heave the mattress out of the window to break my fall, though I reasoned if this wasn't possible that broken legs were preferable to being burnt alive. Planning stops me panicking. If I'm prepared then I'll react appropriately. The first few times Hugh stopped breathing, I went into a blind panic, screamed, cried and called 999. I didn't try to resuscitate him, it didn't even occur to me; I was panicking too much. 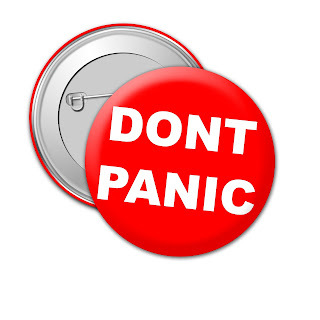 A state of panic is not a helpful state to be in. So now, whenever I go out, I plan how I'll respond if he stops breathing. I know where the oxygen is in the car, I have exit strategies for different buildings I go to, I always have half an eye out for places to pull over when I'm driving, it keeps Hugh safe and it keeps me sane. I know how I'll respond because I've practiced it in my mind. I won't go to pieces, I won't panic. And I rarely do, to be honest. I wait until he's safe in hospital, and all is quiet, and then I'll cry. What I haven't planned for though, is what if something happens to me? Not as in, if I die- that's a whole other stress and panic and worry that will eventually become a blog post if I can stop crying about it long enough to write it (but if you want to read someone's else's take on this in the mean time, my good friend has summed it all up quite nicely here) - but what if I'm in a car accident, or my car breaks down, or I'm stuck in a traffic jam on the motorway and I can't get back to Hugh? Previously this wasn't an issue- invariably Hugh was with either me or Stephen, and the few hours he spent away from me with a carer, I was rarely ever more than 10 minutes away from him anyway, always nearby, phone in hand, ready to get back in the event of an emergency. But he's at school now and spending regular time away from me each week. If I got stuck on the M42 and couldn't get back to school,there's a multitude of people who would look after Sean- grandparents, uncles, friends, neighbours... The list is endless. He doesn't take much looking after- he'll tell you when he's hungry, he can dress himself and go to the toilet by himself. The biggest problem you'd have is that he'd talk the ears off you! But in the event of an emergency Sean is sorted! What if Stephen was in Ireland? And I got run over by a bus and broke both my legs? Or fell ill with appendicitis? Or got trapped in a lift? What if ... What if ... What if? There are any multitude of (mostly implausible) things that could happen to stop me being able to care for Hugh temporarily. So what happens then? How do I plan for that? And this is the point I start hyperventilating. Apart from feeding him via his tube, anyone he is left alone with also needs to be able to resuscitate him (either with a bag and mask or giving mouth to mouth) and administer emergency medicine in the form of buccal Midazolam. There's a wonderful service called +cers who run an emergency service for carers. If you care for someone elderly or disabled, you can register with them. They'll write a detailed care plan and should you collapse whilst out walking the dog, the police- or whoever finds you- will be able to ring the number on the handy little key fob they give you and the +cers service will ensure that the person you care for is looked after for a period of up to 48 hours (longer on bank holidays). It's great service and they're a lovely team. I'd really recommend them if you care for someone with less complex needs than Hugh. They don't do tube feeding however, which for a short period of time isn't a massive issue for Hugh- with cheeks the size of his, he's hardly in danger of starving any time soon. For tube feeds they'd ask a community nurse to come and give them. So it's not ideal, but its manageable. But they don't administer buccal Midazolam. Which is a much bigger issue since its necessary to keep him alive. So that's that plan out the window then. So how do I plan for Hugh's care if something happens to me in an emergency? First- I'll keep praying that nothing ever happens to me! Failing that though, I guess it's Acorns Children's Hospice or the Community Nurse. It's not the best or most detailed plan in the world, but right now, its all I've got. I'm not giving up on finalising a good plan just yet though. I've requested life support training again- it's always good to have a refresher- and I'm hoping some family and friends will be prepared to learn as well. They've done it before, long ago- before Hugh's seizures became really frequent and before we knew what a threat to his life they posed. Our community nurse can train how to administer buccal Midazolam too. So then, in an emergency situation, if I suddenly developed amnesia or was kidnapped by aliens, there'd be a well trained army of people to help out with Hugh too. la la la la la (puts fingers in ears!) I have no idea what would happen to F. My folks would have him but his care is here, his school, friends - my friends who could provide a level of continuity. God I had not even thought - the post you link to is wonderful had no idea about the cerebra vouchers shall look into it. Emma, I know exactly where you're coming from but rest assured in the event of an emergency Hugh will be taken good care of, especially as he has a hoard of friends and family to check up on him wherever he is placed. It's in the interest of the temporary care staff to welcome all and sundry who are familiar to Hugh to make both their jobs and Hugh's stay as easy as possible. From when Marie was little I used to dream that I fainted in the street on my way to collect her from school or that I suddenly went blind and lost my way. That's an easy one to work out, isn't it? I was terrified that I wouldn't be there for her and she would be stranded somewhere. BTW, that place you mention: http://www.cers.org.uk sounds fantastic and I look forward to checking out their website.